This seven-day seminar will be conducted in the peaceful setting of a Mahayana Buddhist monastery in Ukiah, California. It is an introduction to early Buddhist literature written in Classical Chinese. Participants will read a selected work and related Chinese commentaries. Students will work with Buddhist monastics who are experienced translators. This seminar is intended for students who have already studied Classical Chinese. Students should have at least one year of Classical Chinese before taking this course. Knowledge of Buddhist history and philosophy will be helpful, but is not required. Applications will be reviewed and accepted based on suitability. The instructors and TAs come from a variety of backgrounds and hold varying academic degrees. For bios of selected instructors and TAs, see below. Bhikshuni Heng Chih, a Buddhist nun, became fully ordained in the Chinese Mahayana tradition in 1969 under the guidance of the late Venerable Master Hsuan Hua. She is currently a full-time professor at Dharma Realm Buddhist University, having just retired from serving six years as an adjunct assistant professor of Buddhist Philosophy at Bond University in Gold Coast, Australia. From 1973 to date she has been a translator, bilingual reviewer, English editor, and bilingual certifier of Buddhist Text Translation Society publications, which involves working with Buddhist Canonical Chinese, modern spoken Mandarin commentaries, and classical verses. Bhikshuni Heng Chih holds MA and PhD degrees in Translation of Buddhist Texts from the Dharma Realm Buddhist University. Bhikshuni Heng Yin grew up in Austin, Texas. She was ordained in 1992 under the guidance of the late Venerable Master Hsuan Hua. She holds an MA in Translation of Buddhist Texts and an MA in Buddhist Classics from Dharma Realm Buddhist University, as well as an MA in Asian Studies from UC Berkeley. In addition to working on various translation projects for the Buddhist Text Translation Society, she served for twelve years as Girls’ Division Principal of the Instilling Goodness Elementary School and Developing Virtue Secondary School at the City of Ten Thousand Buddhas. She strives to apply Buddhist principles to contemporary concerns such as the character development of youth, environmental protection and animal welfare. Bhikshuni Heng Yi grew up in Taiwan and was ordained in 1995 under the guidance of the late Venerable Master Hsuan Hua. She holds an MA in Asian Studies from California State University - Long Beach, and a PhD in Buddhist Studies from UCLA. Since 2011, she has been an Assistant Professor at Dharma Realm Buddhist University, teaching courses on Mahayana sutras and shastras. She has been a translator, reviewer, and translation team leader for the Buddhist Text Translation Society. She aspires to help develop a Buddhist Text Translation Institute as a space for those with talent in languages to be trained and to translate Buddhist texts as a form of spiritual practice. Bhikshuni Jin Jing received a Bachelor’s Degree in Information Systems and Management in the University of Maryland Baltimore County and holds an MA in Translation and Languages at Dharma Realm Buddhist University. She entered the monastic life in 2005 and was ordained in 2009. As an active translator for Buddhist Text Translation Society and Vajra Bodhi Sea, she has been involved in various translation projects, including the Shurangama Sutra and the Avatamsaka Sutra. She also was the simultaneous/consecutive interpreter and translator at many large-scale events such as “the Middle Length Discourses of the Buddha (Majjhima Nikāya) Seminars by Bhikkhu Bodhi” and “the Third World Buddhist Forum, 2012.” Currently, she is a TA and the Communications coordinator helping the Dharma Realm Buddhist University in the areas of communication. Chris Wen-Chao Li is Professor of Linguistics at the Department of Foreign Languages and Literatures at San Francisco State University, where he teaches courses in general linguistics, news writing, calligraphy, web applications, and advanced Chinese language, and graduate seminars in Chinese phonology, semantics, morphology, translation theory, and consecutive and simultaneous interpreting. Prior to the present appointment, he lectured on advanced-level English, phonetics, phonology, creative writing, news writing, and translation studies at National Taiwan Normal University, and taught Chinese language and poetry at the University of Minnesota. He has also served as Adjunct Professor in Translation at the Monterey Institute of International Studies, and worked as a Chinese language current affairs producer and radio announcer for the British Broadcasting Corporation (BBC) World Service in London. Dr. Li received his master and doctoral degree in General Linguistics and Comparative Philology from Oxford University, where his research focused on Mandarin sound change and Chinese phonology. He is the author of A Diachronically-Motivated Segmental Phonology of Mandarin Chinese (New York: Peter Lang, 1999), Media Chinese (Taipei: Shita Books, 2005) and numerous scholarly treatises on language and translation. His translations of Chinese prose and poetry have appeared in Renditions (Hong Kong) and The Chinese Pen (Taipei). His current research interests include sound change, language contact, diglossia, standardization, phonological translation, Chinese romanization systems, and the phonological description of Mandarin Chinese varieties. Nancy Chu graduated from Swarthmore College in 2010, where she double-majored in Chinese and English literature. She completed her Master of Divinity program in Buddhism this year at Harvard Divinity School. She served as a student co-leader of the Harvard Buddhist Community for the 2013-14 academic year, and has translated occasionally for Dharma Realm Buddhist Association’s monthly journal Vajra Bodhi Sea and evening talks at the City of Ten Thousand Buddhas since 2006. Lotus Lee is a graduate of Santa Clara University, where she obtained a BA in chemistry and minored in religious studies. She obtained an MA in religious studies from Stanford University with concentration in Chinese Buddhism in 2013. She has served as a regular interpreter during weekend events at Gold Sage Monastery and a translator for Dharma Realm Buddhist Association’s monthly journal Vajra Bodhi Sea. In the fall, she will begin pursuing a doctorate at UC Santa Barbara's department of East Asian languages and cultures. Shiying Pang grew up in Mainland China. She received her BA and MA in History from Fudan University, with an emphasis on Chinese Buddhist history and thoughts. She received another MA in East Asian Studies from University of California, Santa Barbara in 2009. Now she is a PhD candidate in Group of Buddhist Studies, at University of California, Berkeley. Her academic interest focuses on the reception of prajnaparamita literature in medieval China. Alejandro Gracia-Zhang is a rising senior at Developing Virtue Boys' School. He moved to CTTB with his parents and younger brother eleven years ago and has attended the schools since kindergarten. 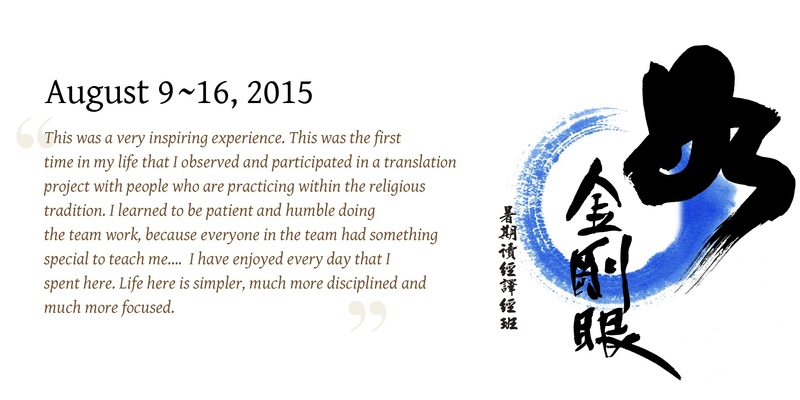 He has been translating Chinese Buddhist texts and teachings for one year under the guidance of Bhikshu Jin Fan. He attended the translation seminar last summer. For more information, contact iitbt@drbu.org.